This movie caught me totally by surprise. It showed up unannounced in my Amazon Prime list and on a whim I decided to try it out. An interesting thing about that last comment is that most of the movie is spent on the inside of a vast urban city tower, running up and down corridors, shooting things and people up. But the way the movie is photographed, edited, and choreographed you don’t have a tiresome boring by-the-numbers floor-by-floor fight-fest like The Raid. In Dredd you know where you are and where the bad guys are at all times. You get plot twists tossed at you but the logic of Dredd’s inevitable judgment is inescapable. Karl Urban adds another capstone to a lustrous action career thet now includes not only Dredd but Lord of the Rings, Chronicles of Riddick, and Priest. And you never get to see his eyes under that helmet! 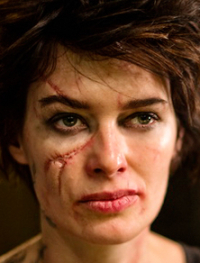 Lena Headey proves again she is well on her way to becoming the go-to actor for psychopathic female leaders. This woman does not fool around and is just plain fun to watch. I would love to see her play a character up against “Alice” in the next Resident Evil movie. The movie is very well photographed. Scenes are interestingly but not ostentatiously framed. Lighting is such that, even when shadows abound, you can always see what is going on. I especially loved the coloring; much use is made of yellow, orange, and gold, in contrast to the washed out blues and greens we’ve grown accustomed to in so many fantasy and science fiction films. Think about the lighting from the early scenes in Blade Runner, especially the scenes of the exterior and interior of the Tyrell Corporation. Then apply that to a gritty vertical city constructed from hundreds of layers of cheesy and decaying urban shopping malls. But sort of pretty, if you know what I mean? This is a violent movie. Its R-rating is well-deserved. Maybe that’s why it didn’t do better at the box office. I suspect, though, that now that it’s more widely available a lot more people are going to discover it.